When you stay at Queen's Hotel in Southsea, you'll be by the sea, a 5-minute drive from Gunwharf Quays and 7 minutes from Spinnaker Tower. Featured amenities include dry cleaning/laundry services, a 24-hour front desk, and an elevator (lift). Planning an event in Southsea? This hotel has facilities measuring 25 square feet (2 square meters), including conference space. Free self parking is available onsite. Follow M27 and then M275 towards the north end of Portsmouth town centre and Continental Ferries, at the Rudmore roundabout take second exit into Kingston Crescent. The Travelodge is on the right. Located in London (Kensington), Earls Court Studios is within a 10-minute drive of Natural History Museum and Hammersmith Apollo. The front desk is staffed during limited hours. 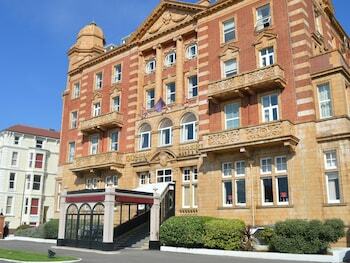 Located in Blackpool (South Shore), The Bambi is minutes from Blackpool Illuminations and South Pier. The front desk is staffed during limited hours. Located in Hawnby, Inn at Hawnby is in a rural location and within the vicinity of Rievaulx Abbey and Sutton Bank National Park Centre. Free self parking is available onsite. When you a stay at Acqua Beach in Weymouth, you'll be near the beach, just steps from Weymouth Bay and Weymouth Beach. Free self parking is available onsite. Centrally located in York, this apartment is within a 15-minute walk of Clifford's Tower and Merchant Adventurers' Hall. Free self parking is available onsite.